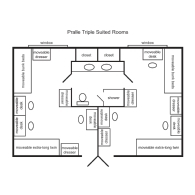 Pralle-Sodaro Hall is arranged into four floors, each with two wings. All rooms open to an interior hallway with the main stairwell in the center of the wings. The building offers underground parking that is reserved for students living on campus. Pralle-Sodaro is the closest residence hall to main campus. Room measures approximately 19'4" x 11'5"
To learn more about what you should bring with you to your Chapman room, visit Moving In.